Thanks so much Alanna. Yours is the first comment from someone other than my family and friends! I appreciate the encouragement! Leigh - I haven't tried the 30 MM one, but I can tell you the one in the magazine was soooo good, so I'd choose that one. You could make half of it if you are worried about having too much of it. Thanks for the review. 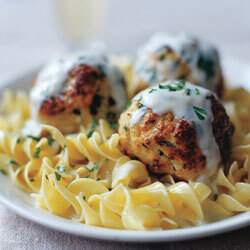 I was looking for a turkey meatball recipe and you convinced me to give this one a try. I really love the easy banter to your blog. Thanks again. Thank you, Anony. That is one of the nicest compliments I have ever received about my blog!